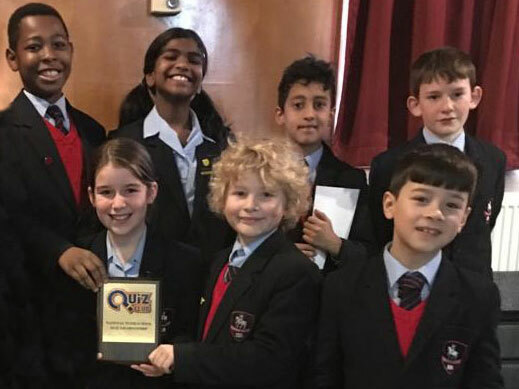 On Tuesday Salcombe sent two teams to Forest School in Snaresbrook to take part in the regional heats of the National KS2 General Knowledge Quiz. The teams were chosen after every pupil from KS2 took part in a quiz just before Christmas. The highest scorers from each year group were chosen to represent the school. This term all eight pupils have been working hard, giving up their lunch break time to improve their teamwork and tactics. The competition itself involves each pupil working with their teammates to decide the answer and then pressing their agreed choice on a key pad. This makes the event very exciting for spectators, as scores are shown on a big screen after each question. The level of knowledge shown across a wide number of topics was outstanding and the scores remained very close throughout. Both of our teams were in contention as we reached the last questions and both dis amazingly well, scoring over 2000 points. After the last question had been answered Salcombe 1 finished fourth just 5 points behind third place. Salcombe 2 did even better and managed to claim first place by just 5 points. This means they qualify for the next round of regional heats. I was very impressed by both teams knowledge, but I was even more impressed at how well they communicated and cooperated as teams.